Below are unsolicited testimonials from some of our parents regarding their children and the success they found at Eaton Academy. Please feel free to contact us if you desire to speak with one of our parents about their personal experiences here at Eaton Academy. We cannot thank you enough for helping us get our daughter through high school. To say that high school has been a rocky road would be an understatement. I wish we had found Eaton Academy earlier. You have such a wonderful program for such a wide variety of kids that I am so impressed and feel very blessed that we have been able to participate and see results. I have passed your information on to other parents who were looking at programs for their kids and will continue to do so. This school has helped our son so much. He’s ready for college full of confidence and self-esteem. The personal attention made all the difference! I greatly enjoyed the LEAP trivia night! I was so impressed by the LEAP students and their knowledge. I was also very impressed that the owner of Eaton came and stayed for the whole event. Staff members Mr. Fix and Mr. Burdett along with the other parents who attended made me realize that passionate people can do anything and that these wonderful students are the beneficiaries of Eaton’s commitment. Genuine thanks to each of you. Thank you so much for being so nice to me since I started Eaton Academy. You have been extra kind and been willing to help me adjust and become part of Eaton, and I appreciate all you’ve done. My daughter truly enjoys school now, and she really wants to learn! I never thought that would happen! My son has just finished his third semester at Georgia State University, and he’s made the Dean’s List every semester! He could not have made it to college, let alone done this well, without Eaton Academy. His teachers were wonderful! LEAP helped my daughter tremendously. It provided her with valuable work experience, strengthened her confidence, and gave her that spark back. She learned a great deal from her internship experiences and classroom instruction. We have seen a positive change in her attitude, social life, and overall spirit. We are very grateful for finding this program. I don’t know where we would have been without the guidance and support of Eaton’s teachers and administrators. They’ve helped both my children so much! I’m truly amazed! I cannot brag enough on my son, this school, and its staff. He’s done a complete 180 within the first year. He truly loves Eaton and is learning something new about himself and his academic ability every day. We owe a lot of Kristen’s success to the solid foundation you have given her at Eaton. I truly believe she would not be able to handle any of this transition to our new home and high school without all of your caring and hard work during her middle school years. You are truly the finest school this family has encountered. My daughter is working at her own pace and doing more work than she ever did in traditional high school classes. Eaton Academy is an excellent school that cares about the success of the student. My child had trouble elsewhere but finally found success here. 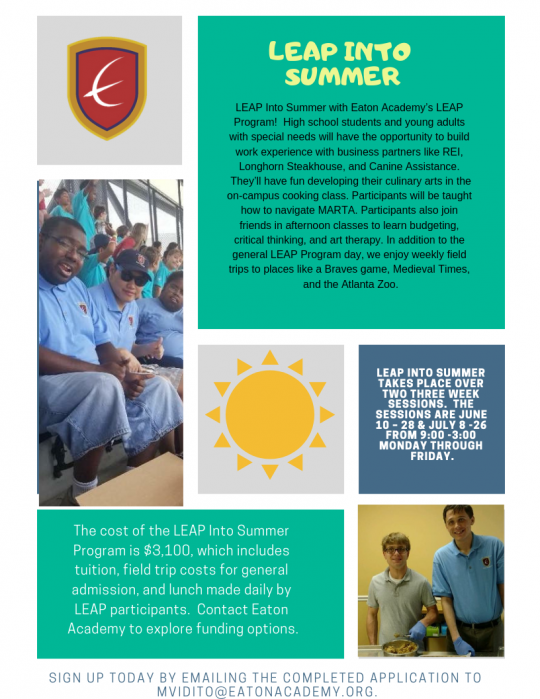 LEAP gives my son a wonderful opportunity for job exposure through its internship. He experiences a variety of work environments and tasks, and gains valuable knowledge and skills for real life work. He also developed invaluable friendships and a sense of belonging both at LEAP and his workplaces. It is a joy to see my son go through these important phases in life with the support LEAP provides. Eaton Academy gave my son the time to mature and finish his education in his time. With all the setbacks he’s had the last couple of years, you all have been a true blessing!! I will forever sing your praises! Actually, I have an acquaintance whose child is falling behind and could use Eaton’s help. I will speak to her and tell her how helpful and accommodating Eaton has been. Plus, there are so many options to choose from for an education at Eaton. The Independent Study Program was perfect for my daughter. Thanks again for helping her realize her dream to start college early. I cannot possibly convey my sincere gratitude to Eaton Academy and its staff. When I thought my son had thrown his future down the drain, your school provided an alternative that I didn’t know existed and one I didn’t think would work for him. Instead, he has been motivated and dedicated to get this done. He sees a future for himself and so do I and his grades qualify him for the HOPE scholarship. At George Mason University I’ve made Dean’s List every semester, and needless to say I don’t think I would have been able to do it without my time at Eaton Academy. Eaton helped me tremendously with my time management, which is an essential part of college life that I think most students lack when coming in.